The men’s lacrosse team began its 2014 NCAA Tournament run in style, defeating Sewanee University of the South 25-4 on Wednesday night. With the victory, LC will advance to the second round of the NCAA Tournament for the third-straight year. With the victory, the Hornets (17-4) will head to Washington College on Saturday. The second round match-up will begin at 1 p.m. The Hornets wasted little time in getting on the scoreboard, as David Alyanakian fired in his only goal of the night at 14:27. It would be another three minutes before Lynchburg would add another tally, but it was the start of a furious barrage. Austin Stewart scored the first of his five goals on the night at 11:29 and by 6:23, LC had a 9-0 lead over the Tigers. Stewart finished his hat trick by that time, and Campbell Armstrong notched a double. Dane Angell, Chris Hower (pictured above), and Todd Galvin were the others on the score sheet. Galvin tallied his second at the end of the first to put the score at 10-0. Stewart opened up the second quarter with his fourth before Sewanee’s George Bukawyn finally stopped the streak. But Lynchburg went on another run, scoring six more before the Tigers could end that streak with two of their own. Galvin finished his hat trick with only five seconds left in the half as the Hornets went into the intermission with an 18-3 lead. The second half proved to be a similar story, only at a much slower space. LC scored three goals in the third and four in the final period, with the Tigers only putting one in the back of the net during the final 30 minutes. Lynchburg had a remarkable statistically. The Hornets nearly shot 50% (25-52) on the day, were perfect on clears (15-15), and won 21 out of a possible 31 faceoffs. Galvin led the team with six goals and three assists; Stewart had five scores and one helper; Armstrong notched four goals; and Aaron Murphy put two in the back of the net to go along with a game-high four assists. Hower and Angell each scored one and assisted on one, with Charlie Oldendorp firing a double and one helper. Chris Cornelius and Ryan Kardux added the other LC tallies on the night, and Robert Arnold had his first NCAA point with an assist. 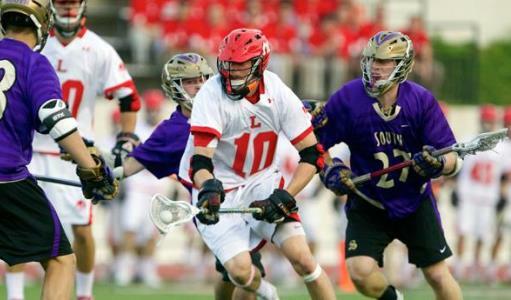 Harrison Brennan picked up a game-high six ground balls and won 11 faceoff attempts, to go with his two assists. Michael Morris finished with two goals and two assists for the Tigers (12-5 overall). Andrew Fawkes and Chris Hawley combined to make nine saves in the victory.